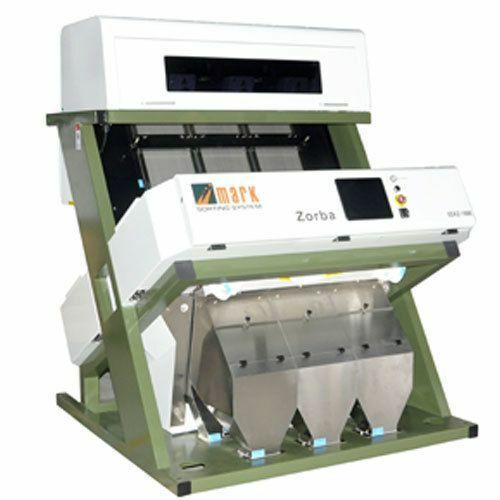 "Mark Color Sorter" domestically first initiated CCD duel color sensor technology 5000x2 pixel,realizes discolored area less then 0.02mm, applicable for different beans and nuts sorting solutions. Wide channel for material input,configured with high speed digital processing technology system assamblization and sorting is highly perfected. 5000x2 pixel Bi- Chromatic CCD Color camera double sides are already been adopted by majority of colors sorters worldwide due t its superier performance in rice color sorting machinery.we are the first and only Indian color sorter manufacturer to adopt this camera technology and offering at competitive price.The camera and our signal processing algorithm combined identified the smallest color differences and dots. Operating the Smart Max RX is made easy with clear bright TFT LCD Touch Screen Interface Module. The Touch Screen Menus has been designed for ease and simplicity of use.Fewer and simple steps of menus and parameters make the machine to suit for the variety products and give the user desired level of performance. Sorting accuracy depends up on formation of rice which passes through ejection point with smooth flow is vital points of sorting quality Smart Max RX fix fitted with hardened natural polished and seasoned alloy chute deliver the great performance 28 channels chute each 6mm width for smooth flow of normal rice varieties. We valve your products. Every good rice ejected will reduce your profit. Minimizing the ejection duration for every signal pin point the impurity rice only and the good rice waste is reduced Smart Max RX is the first Indian color sorter to use the 1 mill second fast switching ejector valves operates up to 1000 ejections per second.